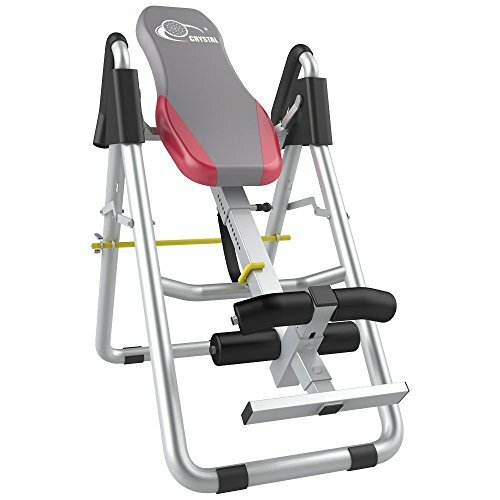 Crystal Home Use Sports Equipment Inversion Table Thrapy System Fitness Equipment Whether you want to reduce back stress or fatigue or stimulate your blood circulation, the Crystal inversion table makes a great household accessory. The inversion table contributes to your body's overall health by optimizing lumbar traction, thereby relieving pressure on your vertebrae discs and ligaments. And when your back starts to relax, the rest of your body follows. The table can also help with such areas as increasing body flexibility for improved athletic performance, reducing the effects of aging due to gravity, and relieving lower backaches due to sitting or standing. Steel tube frame inversion table with memory-foam nylon backrest, padded and powder-coated finish. Tough rubber non-skid floor stabilizers, inverts up to 180 degrees to help relieve chronic back pain and lower back pain. Sturdy and works great. If you have any questions about this product by Richarm, contact us by completing and submitting the form below. If you are looking for a specif part number, please include it with your message.